Unity Church of Santa Barbara - Lawrence Thompson Architects, INC. 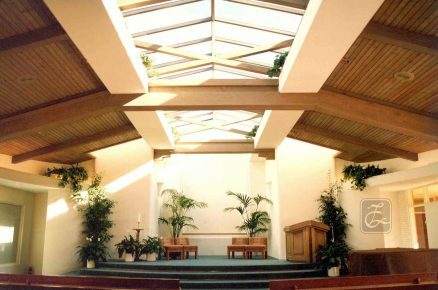 The soffits on each side of the Chancel reach into the Sanctuary, and a long skylight extends to the back of the Chancel and Altar, creating a connection with the sky and nature. Despite a flat roof, a sloped ceiling inside creates a sheltered character, with the beams arching into the skylight, stretching upward. 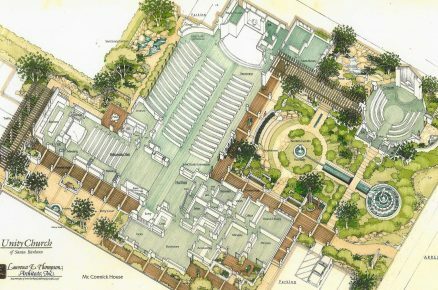 Later on, the church engaged this firm to prepare a Master Plan and design Phase One to renovate the grounds, replacing a large asphalt paved parking lot adjoining the Sanctuary with flowering gardens. One minister said, "This place speaks to me."